Originally released late last year murder simulator Party Hard has now arrived on consoles. A colleague at my day job was going on about this on a daily basis but I thought he was talking about an actual party game, as soon as I realised he meant this game was now on consoles I rushed home and brought it (£9.99 UK). 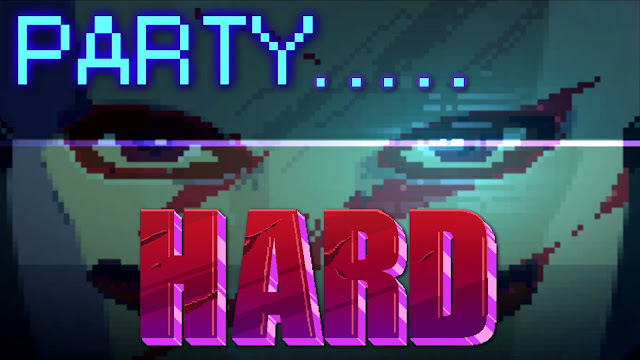 Party Hard is a single screen puzzle style game in which you must isolate and kill a set number of people per level. You can kill by one swift knife stab but should you be in view of anyone else then the police will be called and you will get arrested. If a body is found the police will also be called, but you can always hide the corpses in convenient skips, manholes etc. Also dotted around each of the levels are specific booby traps that can be set up to create 'accidental' deaths, such as rigging a cooker to explode, pushing someone into a bonfire, dropping a tree on someone, angering a horse so that it kicks out at someone etc. You can get access to a variety of tools such as poison, some smoke, stun and traditional bombs, as well as a change of clothes that can all be used to help in your dark deeds. Controls are simple enough, you have one button to stab, one to do a limited run, one to pick up bodies, one to trigger environmental traps, and one to dance (it is a party after all). 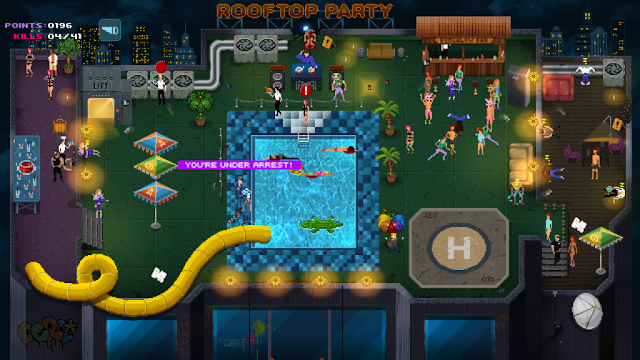 Each time you replay a level the environmental are slightly randomised and the number of party goers changes slightly. Special mention has to go to the fantastic soundtrack, it never reaches the highs of Hotline Miami (which this feels like a stable mate to), but is still supremely catchy and comes close. 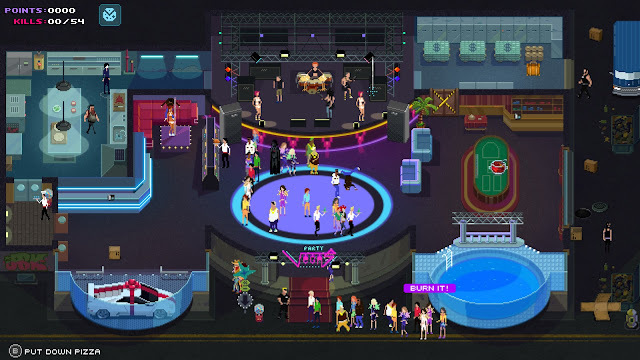 Visually the game is very charming with lovely pixel art used for the aesthetic, kind of like a moving Where's Wally (Where's Waldo for you Americans), guests go about their business, dancing, wandering about and sleeping, there are many different types from punk rockers to bikers, musicians, and people in fancy dress. Along with police out to arrest you there are also bouncers who can stop your spree with one punch, F.B.I agents, and even S.W.A.T teams. Each level has some slight randomness to who visits, one level saw the arrival of a U.F.O that beamed down aliens who started abducting people, twice the party I was at got invaded by zombies who quickly infected everyone leading to a cheap feeling victory (killing zombies doesn't count as murder). Luck can go both ways though, sometimes a limo full of extra guests will roll up, so is swings and roundabouts. Onto the problems then and unfortunately Party Hard has them in droves, it has so many bugs and glitches in it's current form that it feels like an alpha build. The frame rate sometimes drops to ridiculously low levels, it is very frustrating to fail a level due to the game chocking. Sometimes cops will target you for arrest despite you not doing anything remotely suspicious, and the last level features a bug where the D.J is invisible, twice I killed all but one party member and had to give up confused as to who the missing one was, only looking online I found out where the invisible D.J was situated; not cool. The game seems to be missing some animation frames also, pushing someone into a fan for instance leads to them vanishing, while triggering a car to mow down people leads to some managing to escape harm due to the game struggling to process them dying. 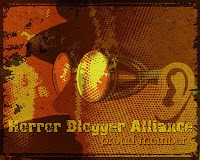 The graphics can also be very lazy at times, the only difference between sleeping and dead people is a splash of claret for instance, it seems corners were cut at every opportunity. For the first half of the game I was really loving it, each new level was a delight to see and felt inventive, a party in the country, one at a beach, a casino, a rooftop party, and a boat, even a fun short level that takes place on a party bus, by the mid point the lazy design seemed to show it's face again with it being obvious that some of the later parties are just re-skinned copies with pretty much the same layout. The actual goal; that of killing everyone also starts to get a little tiring while the plot is functional (a detective explaining events to a mysterious stranger during loading screens) but does nothing exciting. Upon completion of the story we finally get to see a glimpse of what Party Hard maybe should have been. There are seven bonus levels, all that do inventive things to spice up the core game play, one for example has you on a sinking ship with only three minutes to kill everyone before it goes below the waves, another has a limit of five minutes in which you must survive hordes of zombies, another one changes up the 'kill everyone' pattern by having half the crowd be bouncers, and having a V.I.P protected by S.W.A.T members who you have to lure away. These bonus missions all felt so fresh, if the game had been a series of puzzles like these then it would have been more fun to play.